Gospel Singer Cynthia Appiah-Kubi popularly known as Cee of TV3 Mentor fame has revealed why she is married to a Pastor like most Ghanaian Gospel Musicians. Cee who has been off the music scene for over four years, in an exclusive interview on Neat FM’s “Entertainment Ghana” said she took a break from music to concentrate on her family. According to her, she left Ghana to America in 2013, got married and now blessed with kids a male and a female. 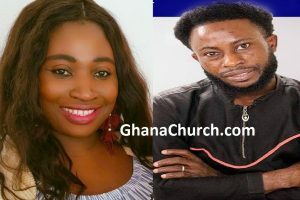 The “Osabarima” hit maker is married to Pastor Anthony Nana Boateng Addo and she explained why decided to marry a man of God. Cee announced during the interview her return to music and indicated that she was not returning by the name she was known by. She revealed that her new stage name was going to be “Adepa Cee”. The musician went on to reveal that she is back for good and she going to drop her third studio album to mark her return into the music fraternity. Adepa Cee has released two singles “Gye Me” and “Aseda” off her upcoming album to be released under Fadacee Music and Video Production company. Adepa Cee became popular after she particated in a TV tarlent hunt show, TV3 Mentor season two. Famous among the music shows to grace our television screens was TV 3’s Mentor. The program that was a talent hunt for people with great singing capabilities was arguably one of its kind in the country. Many contestants instantly shot to fame after the competition and made a name for themselves in the music industry. Among such talented musician was Cee who teamed up with fellow Mentor contestant Isaac and experienced musician, Great Ampong and the trio created some songs together. She was noted for her silky voice and stage prowess. Not long after they had obtained stardom, they went their separate ways. Now, returning to the music scene one more time as Adepa Cee.